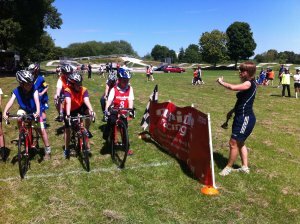 Tracey Fletcher, a cycling coach who has successfully applied for a Coaching Derbyshire bursary, explains how she has become increasingly involved in coaching having been a keen cyclist herself. "I have always loved sport and took to cycling after having my two children. After spending 10 years racing and training, I decided that I wanted to put something back into the sport which had become my passion. That is when I joined Cycle Derby nine years ago as a Level Two Cycle coach, and the enjoyment this gave me was immense. "I find that children are like sponges and just want to keep practising the new skills they've learnt. Their enthusiasm rubbed off on me and I completed my Level 2 in BMX, MTB and track cycling, which I now deliver to schools and colleges in and around Derby City. "My job as Cycle Derby Projects Officer also involves encouraging more ladies to ride bikes and, over the last three years, this has really increased to the extent that they are also now regularly riding on the track in the Derby Arena. 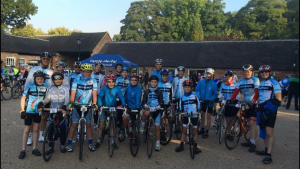 Some of the young cyclists coached by Tracey. "I'm also a coach for a local junior cycling club, which I helped start up three years ago. We now have over 60 members and hold weekly coaching sessions outside on Chellaston Park and on the track in the Derby Arena. "Again, this is another area that has increased in popularity as we now also the coach the adults on the track. "It's great to see how much they have improved and one of my proudest moments was when they rode the 80k route as a well drilled group in the Cycle Derby Sportive last September. "I find coaching so rewarding that I am currently working towards my Level 3 Coaching qualification which will enable me to do one-to-one coaching, and I'm thankful that Derbyshire Sport, through the Coaching Derbyshire bursary, have supported me with this new challenge. "I'm also working towards my British Cycling Level 2 Road and Time Trial Coaching Award, with sessions on that to come next month."